Hi, I am Jonie Lim from Malaysia. This is an assignment from a course that I am currently taking in Coursera, Introduction to Music Production. I will be sharing about the type and usage of some of the studio cables that normally used. I wanted to do this in video format, but I guess I would do this better as a blog post. In a more specific terminology, the word "cable" actually refer to the cord or wire that is used to connect an input device and an output device. However, what we are discussing here about the studio cables that are more focusing to the connectors that act like an interface between the cord/wire with the input/output devices. There are 2 categories of type discussed here. One is balanced cable or unbalanced cable, the other category is analog or digital cable. XLR cable normally used for professional audio applications, such as microphones. 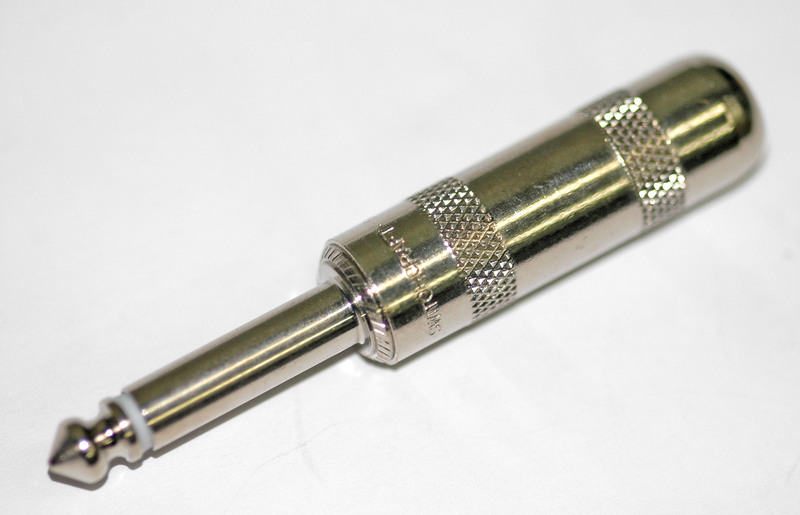 The end points of this cable has a male and female XLR connectors, which has three pins or three holes respectively. There three contacts are for common/ground, positive and negative versions of the signal. This make the XLR cables for balanced connection. This is good for long distance audio signal transmission without signal loss. This is for transmitting analog signal. Picture: "Xlr-connectors". Licensed under CC BY-SA 3.0 via Wikimedia Commons. TS cable commonly used for connecting to guitar and keyboard for line in/out. T stands for tip, and S stands for sleeve. It is a 2-contact connector, one for common/ground signal, and the other contact is for the audio signal. It has part of its audio signal to be carried through the ground, thus it is an unbalanced cable. This is for transmitting analog signal. Picture: "TS 0.25inch mono plug" by Mataresephotos - Own work. Licensed under CC BY 3.0 via Wikimedia Commons. Compared to TS cable, TRS cable has an additional contact, R (stands for ring), which allow TRS cable to work in 2 modes. (1) As unbalanced cable for stereo audio signal connection, (2) as balanced cable for mono audio signal connection. TRS cable commonly used for PC line in/out or phone jack as for stereo signal transmission, guitar/keyboard as mono signal transmission. Again, this is for transmitting analog signal. Picture: "Audio-TRS-Mini-Plug" by Evan-Amos - Own work. Licensed under Public domain via Wikimedia Commons. A midi cable usually have a three or five conductors, a common/ground wire, and a balanced pair of conductors. This commonly can be found on a digital piano or a keyboard. It is also widely used for synthesizer as a MIDI controller. It is transmitting a MIDI signal, which is in digital format. This MIDI format data can be differs from what you hear from keyboard when it is played on a computer. When I used this cable, I found out the in/out label on my digital piano actually should be connected reversely to MIDI cable to work properly. Picture: "Midi ports and cable" by :en:Pretzelpaws with a Canon EOS-10D camera. Cropped 2/9/05 using the GIMP. - en:Image:Midi_ports_and_cable.jpg. Licensed under CC BY-SA 3.0 via Wikimedia Commons. RCA cable is commonly used to carry both audio and video signal. This is commonly used for consumer appliances. However, this is can be the only available option for a budgeted music gear. This can be used for both analog and digital audio signal transmission. for digital audio, the cables must meet the S/PDIF specification. I do have RCA cable, but I do not have an interface to control the gain to the line level that my PC can "listen". Picture: "Composite-cables" by Evan-Amos - Own work. Licensed under Public domain via Wikimedia Commons. USB cable is one of the common connector used to connect to a PC. For example, one of the cable end can be of MIDI connector, and the other end is USB connector. The digital data probably doesn't required a "balanced" method to ensure no data loss, thus this is not categorized in balanced/unbalanced cable. Picture: "USB-Connector-Standard" by Evan-Amos - Own work. Licensed under CC0 via Wikimedia Commons. Firewire cable is similar to USB cable, but it is using a different standards and interface. This is intended for high-speed communication, however, it is not that popular in computer recording compared to USB cable. Just as USB cable, Firewire cable is used to connect the audio interface to the computer. It is transmitting signal in digital format. Picture: "FireWire800 Stecker" by --Fadi 10:48, 27. Mai 2010 (CEST). Original uploader was Fadi at de.wikipedia - Transferred from de.wikipedia; transferred to Commons by User:Wdwd using CommonsHelper. (Original text : selbst fotografiert). Licensed under CC BY-SA 3.0 via Wikimedia Commons. This summarize of the type and usage of important studio cables as below. To connect to microphones and for balanced signal transfer. To connect to guitar/keyboard in balanced mode, and to connect to PC or handset in unbalanced mode. To connect to keyboards/piano or a synthesizer. Mainly used to connect to a computer. Hopefully this post gives an overview of the type and usage of important studio cables.